The 2019 World Economic Forum will take place in Davos from Jan 21-26. LSZH/Zurich along with most other airports in the area will be busy during this period. So if you’re planning on attending— or even if you’ll just be passing through—best get your slot/PPR request in as soon as possible. Will be congested, so apply for slots early if you’re actually planning on stopping there. You might not get the slots you requested, particularly if you want to arrive/depart at peak times. Earliest non-scheduled landing for a wide body aircraft without parking permission will be 1300z daily. Maximum 3 hour ground time for general aviation without parking permission (so drop-and-go’s are fine, as long as they stay within that 3 hour window). You will not be able to use LSZH as an alternate to flights going to LSZS/Samedan. Airport operates from 0500-2100z daily, and overtime is not available – make sure you land before closing time or you’ll get diverted to another airport. 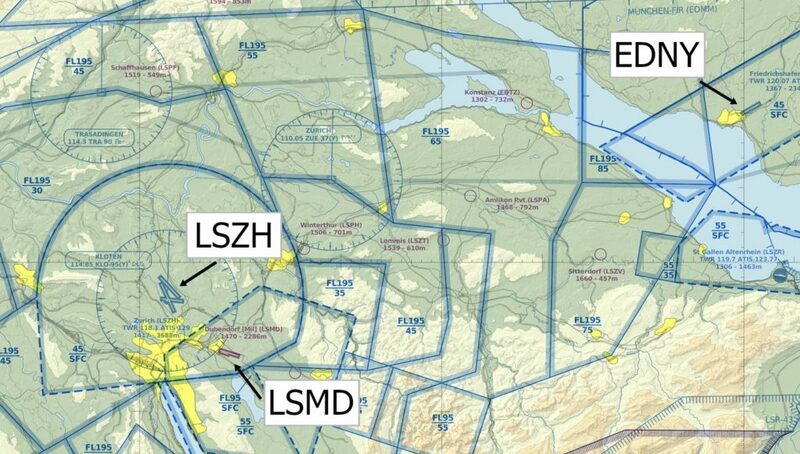 Repositioning from LSZH to LSMD will not be allowed; the aircraft would have to land and depart directly from LSMD. Located in downtown Zurich. Normally a military airfield, but opens to civilian traffic each year for the Forum. Open 0600-2000z weekdays, and 0800-1900z on Saturday, closed on Sundays, with no overtime available. Should have lots of parking available. Slots not required, but PPR is required. Customs clearance is provided in the military terminal building. The airport publishes a special ‘Air Crew Guide’ for any aircraft coming there during the Forum week each year. Bunch of info about the airport and approaches, etc. Open 0500-2100z weekdays, and 0800-1900z on weekends, with overtime available on request. From Jan 19-27, PPR will be required for stays of more than 1.5hrs. Parking should be possible, but expect to be repositioned for parking and servicing. Be aware as this airport is in Germany, fuel will generally be more expensive as the taxes are higher here. No supply issues expected at any of the airports, just expect the normal congestion-related delays with getting a fuel truck out to you on day of departure. For charter flights departing from Switzerland, you can uplift fuel tax free – but bear in mind that taxes will become due and payable if you do not then leave the country within 24 hours.